How can I add these icons? I can't seem to find it in the documentation. Hey @enstulen this must be frustrating, sorry you're having difficult with this. I have added the icons loading, the 512x512 app icon and notification icon, but I still get the error. It's frustrating to know that such a simple thing to do in XCode is seemingly complicated with expo. Didn't work :( Still getting the same error. Bummer! well let me see if I can come up with some other ideas. Do you mind uploading the icon asset you're trying to use here? I can do a once over to make sure you're using the right format, or try it myself. You can extract your IPA with a archive tool and inspect the assets in there yourself.. The only other idea I can think of is having icons in the same default location as the template apps. I sent a message to you on Slack. Closing for now, will reopen if that slack conversation identifies any fix we need to make. Thanks! @dikaiosune @enstulen did you manage to get anywhere with this? I am having the same issue. The image is required to have transparency. I have the same issue. What do mean that the image is required to have transparency. If I save as png does it not have transparency. How can I check if my image have transparency? On Mac, right-click the image and show info. It needs to have an "alpha channel". I exported my image from illustrator and it didn't include it, so I exported it from photoshop instead and it did. Hopefully that helps. I found the issue to also be that the icon I was trying to use was not square or large enough. I don't recall seeing suggested icon size on the expo documentation. It's in the documentation, but it's only recommended. Local path or remote url to an image to use for your app’s icon. We recommend that you use a 512x512 png file with transparency. This icon will appear on the home screen and within the Expo app. They all have alpha channel. Still get the same messaged. I have 512x512 as well with transparency. This app have been submitted before with no problems and I did not change any icons. My issue was a few things. I made the image 200x200 and I was using a cdn for the logo but had to put it local. After that it worked. To test I created a dummy expo project through the XDE and used their icon image to make sure it submitted and it did so I used that as a template. Hope this helps. 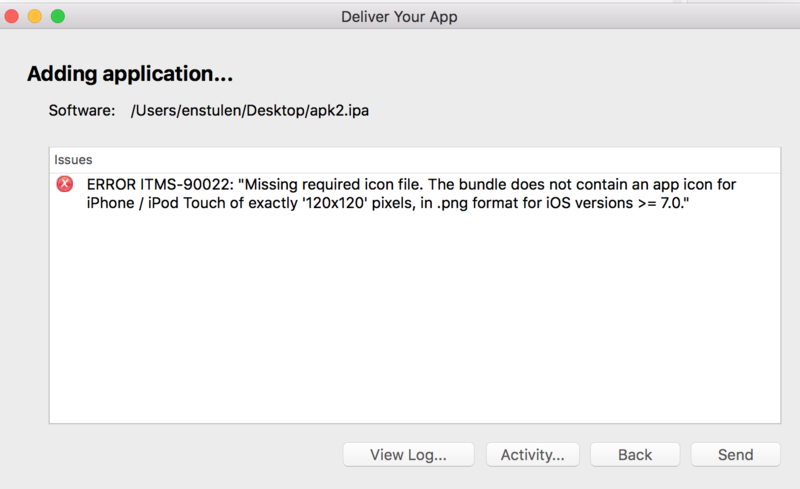 Interestingly, my build passes fine with Application Launcher, but I received an e-mail from iTunes Connect with the same error about 12 hours after the build. This seems like changes on Apple's side, as we were able to submit our app without issue before. Having exactly the same issue. Never had an issue, but now I got this error. I am using sdk 23, app.json points to a 1024x1024 png image with alpha.